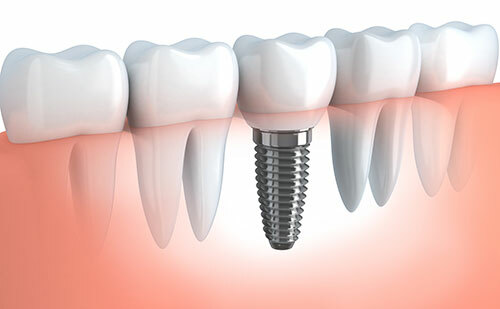 One of the most important recent advances in dentistry is the dental implant. This is an artificial tooth upon which a restoration is made, such as a crown, denture or bridge. The implant itself is made of titanium, which is strong and lightweight. It replaces the root of the missing tooth. Dentists have used Implants successfully for nearly 40 years in dentistry, so they have a long history of effectiveness. They are very strong and provide the stability to chew normally, just as you would on a natural tooth. Unlike bridges or other forms of tooth replacement, we do not need to reduce teeth on either side of the implant. You can brush and floss an implant normally, just as you would a natural tooth, without any special aids or devices. Implants are 100% effective, comfortable, and esthetic, and preserve your natural bite and tooth relationship. Because of all of the above reasons, dental implants have largely replaced most of the older, more outdated methods of replacing missing teeth. We generally do implants in two stages: the surgical placement stage, and the restorative stage (when we place the new tooth on top of the implant). Here at our office, we work closely with a local team of oral surgeons who are among the very best in their field. After the surgeon places the implant, we carefully restore with a crown, bridge, or a denture. Over the last 20 years, Dr. Wooddell has restored hundreds of teeth. For questions or to schedule a consultation, call our Annandale office at 703-698-9698 or fill out the form to the right. We are conveniently located near Fairfax, Vienna, Merrifield and Burke, VA.